Pressure Tea - a natural formula for reducing high blood pressure, cleansing the liver, and decreasing the risk of cardiovascular disease. High blood pressure is a phenomenon usually secondary to arteriosclerosis of the heart, blood vessel problems, hypertension, kidney ailments, and glandular irregularities. Pressure tea contains a mixture of natural herbs for the treatment of these infirmities, and thus can assist in preventing high blood pressure. Ingredients: Tilia (Basswood), Salvia Officinalis (Sage), Passiflora, Taraxacum (Dandelion), Olive Leaves, Inula Helenium (Elecampane), Silybum Marianum (Milk Thistle), Lemon Verbena, Hibiscus. Tilia - Relaxes the blood vessel system. It assists in preventing arteriosclerosis and thus helps in reducing high blood pressure. The Tilia plant is rich in flavonoids, Phenolic Acids, Mucilage, and Tannins. Tilia strengthens the nervous system. Salvia Officinalis - reduces blood pressure by relaxing blood vessels while reducing blood sugar levels. Passiflora - is rich in flavonoids, Isovitexin, Vitexin, Saponarin, Orientin and Glycosides like Gynocardin, Alkaloids and Passiflorin. Passiflora contains Vitamins C, B1, B2, B3, as well as Phosphorus, Potassium, Sodium, Calcium, Iron, Carotenoids, Catalase Enzyme, and Vegetable Fiber. The passiflora plant relaxes and slackens the blood vessels and thus assists in reducing high blood pressure. Dandelion - contains flavonoids, which strengthen membranes and blood capillaries, reduce the porosity and fragility of blood capillaries, strengthen and dilate the blood vessels, strengthen heart muscle, assist in preventing heart and liver diseases, and thus help in preventing and treating high blood pressure. The Dandelion plant reduces the cholesterol level in the blood and thus prevents arteriosclerosis and assists in maintaining a normal blood pressure level. Dandelion is helpful in treating kidney diseases, kidney stones, and urinary tract issues, and as a result it assists in preventing high blood pressure, which often derives from these conditions. Olive Leaves - contain Oleoropein, which expands the blood vessels, and thus reduces blood pressure. Olive leaves contain Bio-flavonoids, which are essential for the maintenance of the capillary blood vessel walls. Olive leaves contain Anti-oxidants, which prevent damage to the blood vessels that typically leads to infections, arteriosclerosis and heart disease. Olive leaves have been proven as being able to reduce blood sugar levels and blood pressure, thus protecting the heart and the blood vessel system. Inula Helenium - reduces blood pressure, the levels of sugar in the blood and, as a result, the solubility of the oxygen in the blood increases and thereby the amount of the oxygen in the blood rises. This process maintains blood vessel vitality and flexibility. It should be noted that the flexibility of the blood vessels is one of the main factors for maintaining normal blood pressure. Silybum Marianum - contains Silymarin, an active material which cleans and rehabilitates the liver. Silymarin reduces the fats in the liver. This in turn allows the liver to regain its normal activity of naturally reducing the cholesterol level in the blood. This progression prevents arteriosclerosis, one of the main causes of high blood pressure. Therefore,Silybum Marianum can help prevent high blood pressure. Silymarin's unique characteristics also assist in protecting the normal functioning of the kidneys, which is another important factor in maintaining normal blood pressure. Lemon Verbena - a soothing plant which has a refreshing lemon flavor. Hibiscus - contains Ascorbic Acid and Glycolic Acid. Also adds natural flavor to the formula. Directions for use: Drink 2-3 cups, taken after meals. 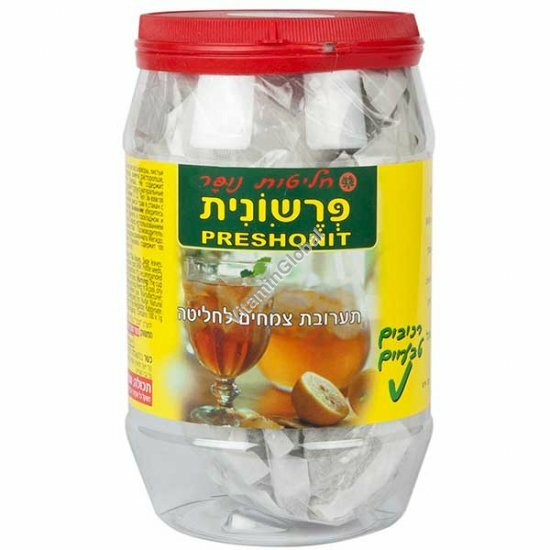 Kosher certified by HaRav Ya'akov Mor Yosef, Emek Z'vulun. Pregnant and nursing women, persons on medication, and parents considering this product for their child should consult with a doctor before using. The information on this page does not constitute formal medical advice or provide any indication for treatment. In case of a medical problem, contact your physician.